The best part of life is never knowing what’s going to happen next, well ok, it could also be said that’s one of the worst parts. I’d like to think it’s the former, even when times get tough. It’s a dirty job, but if someone doesn’t do it, it’ll never get clean! That being said, Mitch’s been burning the candle at both ends, working his fingers to the bone, while taking the house down to the bones so we can build it back up the right way. 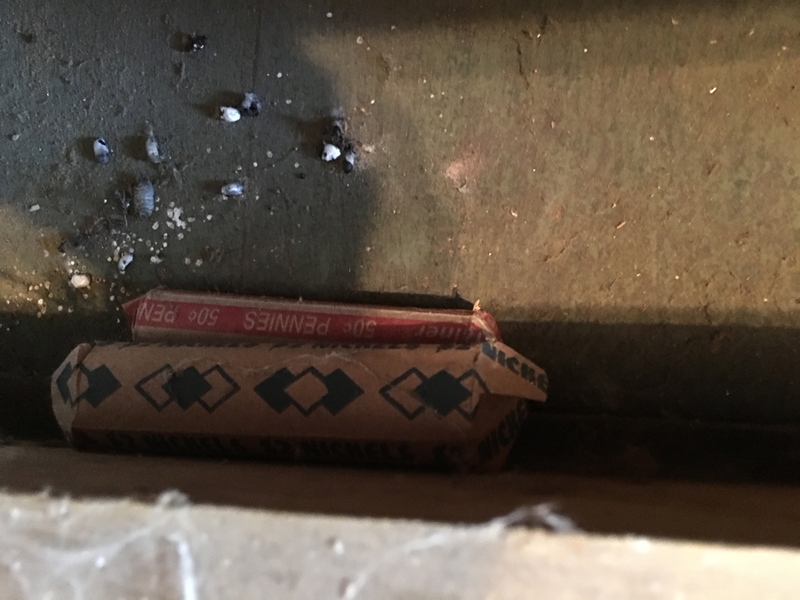 We’ve all heard stories of people remodeling a house and finding a lost treasure, but we never thought it would happen to us. But it did! As I was attempting to clean out all the cobwebs from the custom made closet drawers, I leaned my head into the empty space where the drawers usually sit and I see rolls of coins! Hey, so maybe it’s only $2.50 but that’s more than what we started with at the beginning of the day. 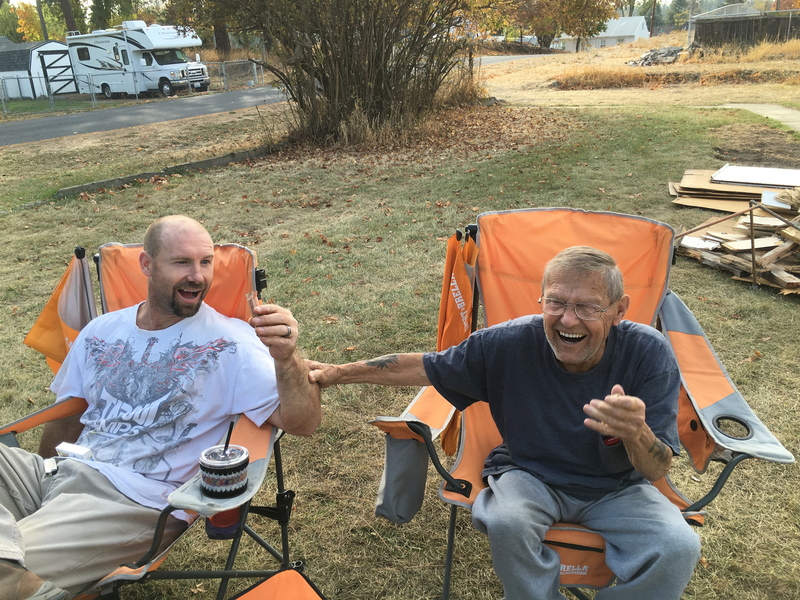 The guys couldn’t be more excited when I run out to share the treasure I’d just found. Going all out is what we’re about when it comes to fixing up a house, and this one hasn’t been any different. 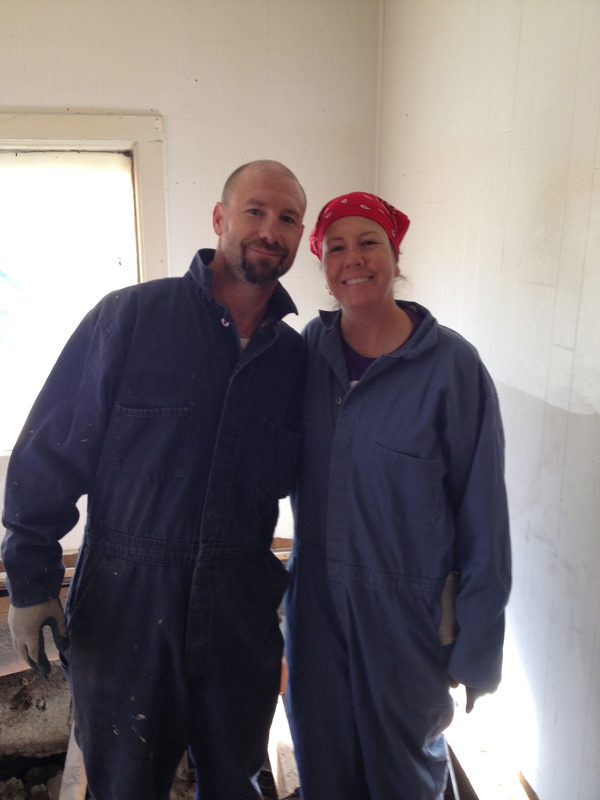 We began working on the house thinking it would be a new paint job, flooring and maybe a new roof. Since we’ve begun it’s been everything, including the kitchen sink! 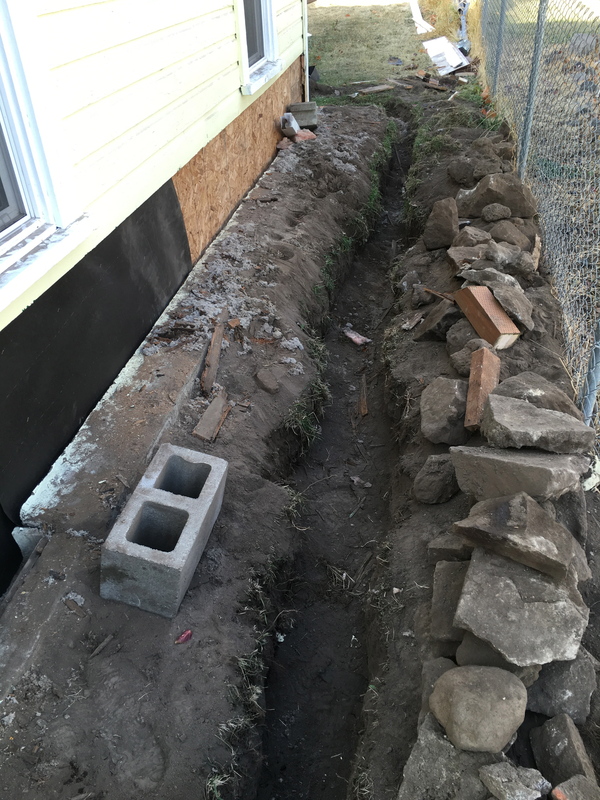 The plumbing, electrical, walls, floors, roof and even the sewer drain was completely busted up and needed replaced. 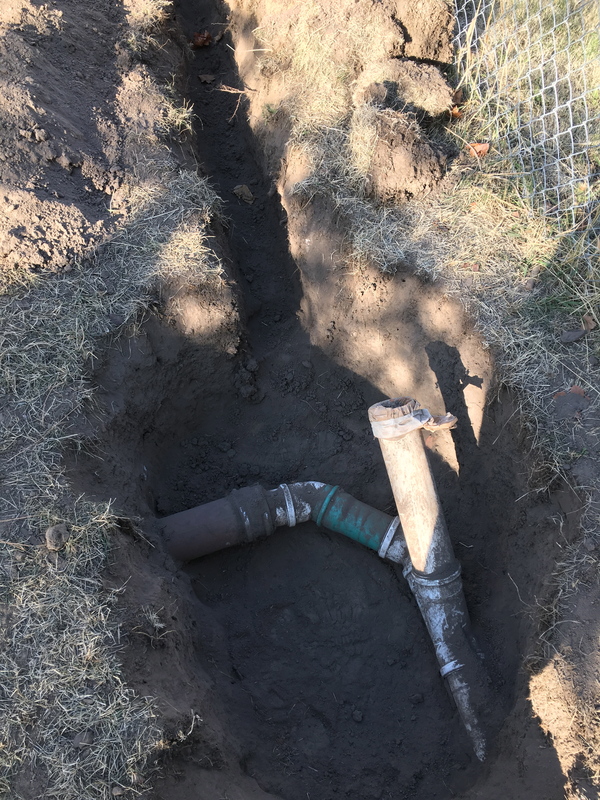 We decided to reroute the drain, making it a shorter (more affordable) and a direct route to the newer drain put in during the 90’s. The future path of the sewer drain. 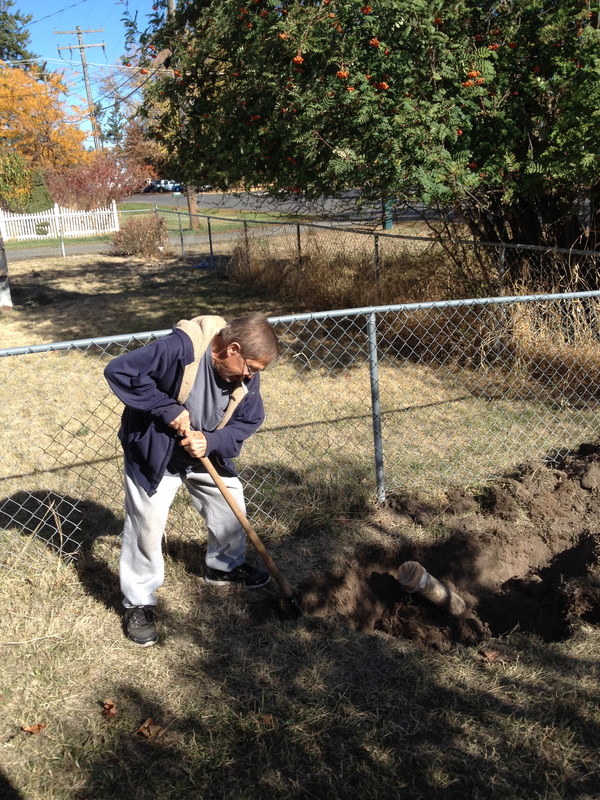 Digging this hole to access where the old and new pipes met was my job. I was darn proud of myself when I got done, especially since I wanted to give up a few times, but just kept on keeping on. 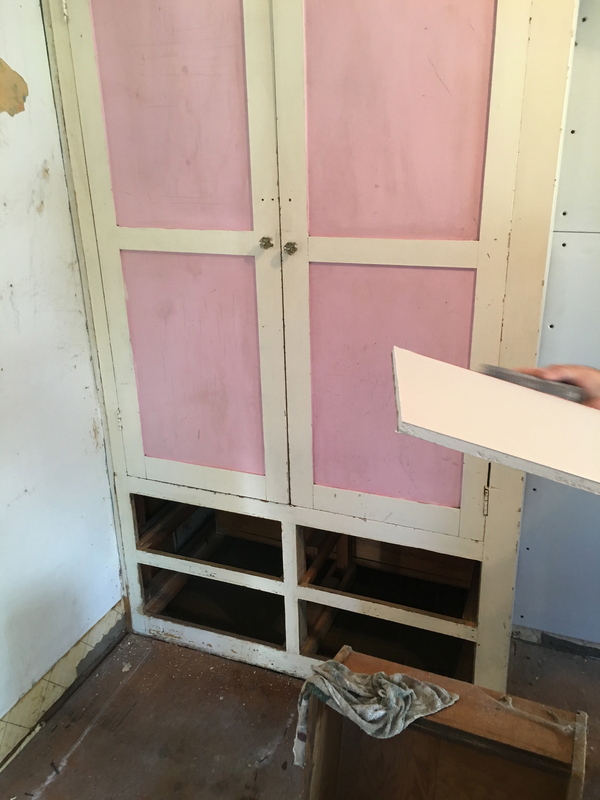 What else can we expect from a house pieced together over the years on a poor mans budget, I’ll tell ya, we should’ve expected shoddy workmanship with parts of the house build on sand resulting in, da.. da.. da… rotting wood that had to be replaced! Such a big no, no!! 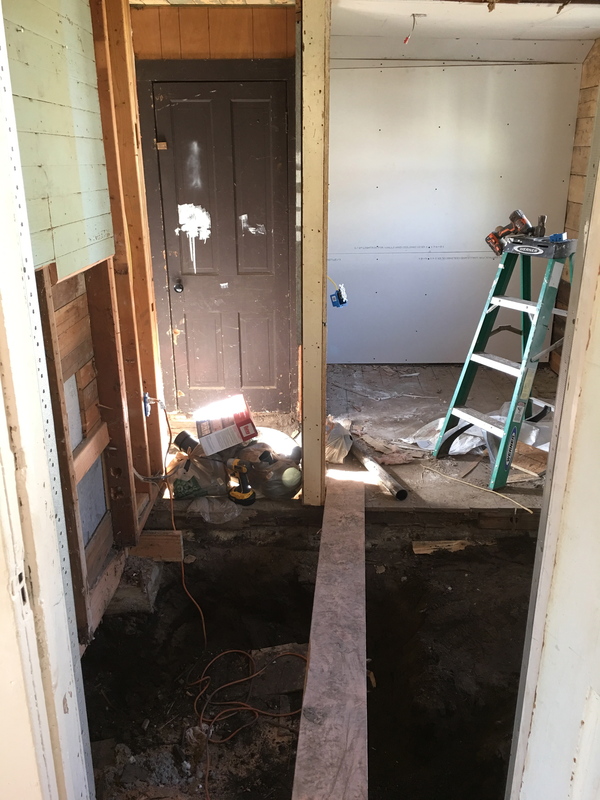 After taking barrels of dirt and sand out from under the laundry room and bathroom we could finally make room to get to the plumbing! Thankfully we’ve build up enough credit that we are able to fix it right, and now to pay all our new bills I was blessed enough to get a part time job as a sales clerk for the Four Lakes Post Office. Having been a rural carrier with the Medical Lake Post Office, I knew it was a super physically demanding job out in the elements and I didn’t want that again even though I loved it. I was ready to do something different so now I’m working in the office. 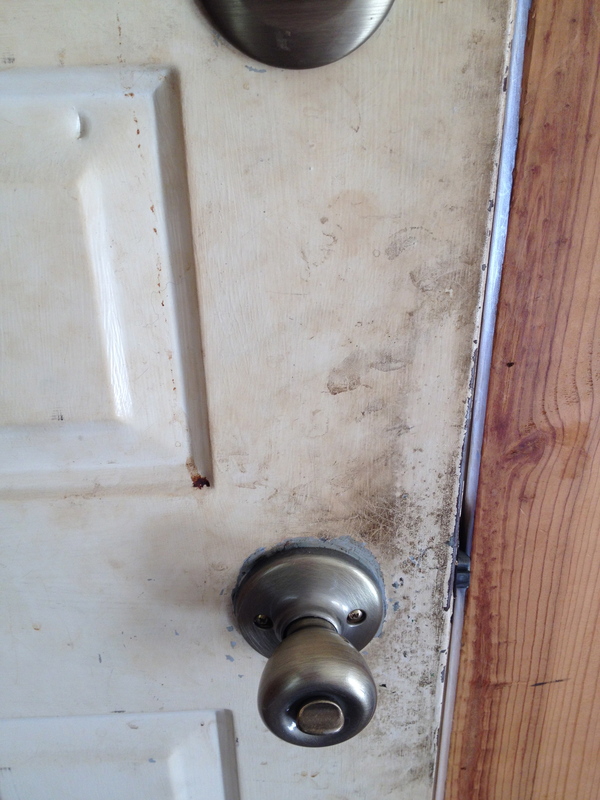 This entry was posted in Uncategorized and tagged dirty, remodel, sewer drain, treasure, trench. Bookmark the permalink. You guys are amazing, not afraid to jump in on a huge task like this! I hope it turns out better than you expected. Keep us posted on the progress. We hope so too! Getting excited to see it come together and can’t wait share the results! Hope you guys have a wonderful thanksgiving!